Amy Meredith Poehler is an American actress, comedian, voice artist, producer and writer. Raised in Burlington, Massachusetts, she graduated from Boston College in 1993 and moved to Chicago, Illinois, to study improv at The Second City and ImprovOlympic. In 1996, she moved to New York City after becoming part of the improvisational comedy troupe Upright Citizens Brigade, which later developed into an eponymous television show that aired on Comedy Central for three seasons. Poehler was also one of the founding members of the Upright Citizens Brigade Theatre in 1999. Poehler was a cast member on the NBC television show Saturday Night Live from 2001 to 2008. In 2004, she became the co-anchor of the Weekend Update sketch along with her friend and colleague Tina Fey. Poehler’s work on SNL earned her two Primetime Emmy Award nominations for Outstanding Supporting Actress in a Comedy Series. She is known for voicing Bessie Higgenbottom in the 2008–2011 Nickelodeon series, The Mighty B! and Eleanor Miller in the Alvin and the Chipmunks CGI films. Since 2009, she has starred as Leslie Knope in the sitcom Parks and Recreation, and received the 2014 Golden Globe Award for Best Actress in a Television Musical or Comedy Series. She is also an eight-time Emmy Award nominee. Poehler is currently starring in the new Swedish-American sitcom Welcome to Sweden along with her brother Greg Poehler. 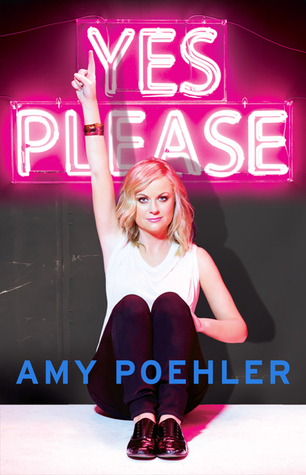 ~Good Ethos: One of the main themes in Yes Please was how Amy Poehler went to the extra effort to help bring women up (regardless of their various roles in her life), I especially loved her chapter dedicated to Tina Fey (it’s my favourite chapter). ~Contributions: I liked how different people contributed to the novel. I also like the photos of various people involved in Amy Poehler’s life such as the one that compares Amy Poehler’s mother holding a new-born Amy, side by side with a picture of Amy holding her new-born son Archer. The chapter about how Amy Poehler went to Haiti to aid with a charity group was heart-breaking sad and sweet at the same time. Overall, a great read from an inspiring woman, who manages to make the ordinary hilarious and the painful moments bearable, all the while remembering it could be so much worse. Everybody loves Amy Poehler don’t they. OMG her last name is actually part of the dictionary and it doesn’t underline red. That’s how much they like her. The dictionary likes her. That is like next level.